We are still a good while away from the start of the 2014/15 NBA Season but sports fans and the media cannot help but look off into the distance. There is no doubt that teams have to prepare in advance and this means that while a lot of hard work is being carried out to ensure that this season is a success, there will be people working behind the scenes to ensure that the following years are a success to. This is really notable when it comes to scouting and it seems as though some scouts are already getting excited about potential NBA draft picks for 2015! There are draft projections for 2015 already in place and a number of people are tipping Emmanuel Mudiay to be the number one overall pick. This player has shown himself to be someone that doesn’t always follow the conventional route. In the forthcoming season, Mudiay is not going to be playing college basketball, in fact, he isn’t even going to be playing in America! Mudiay has announced that he is heading off to China and he will be playing for the Guandong Southern Tigers. Some people may question why the player is going to China to play basketball but it may be that there 1.2 million reasons why he is spending a year abroad in the Far East. Yes, it is believed that Mudiay is going to receive $1.2m for playing in China for a year. There is a lot of money flying around the youngster at the moment and the player has recently signed an agreement with Under Armour. The sportswear company is trying to increase its foothold in the NBA and by grabbing Mudiay now, they are playing the long game. The company already has players like Brandon Jennings, Steph Curry and Kemba Walker on board and they are delighted to add the Dallas youngster to their list of players. The full details, including the financial package, has not yet been announced but the company has announced that the deal is a “full partnership” deal. This means that footwear and training gear will be included, alongside plenty of other bonuses and features. 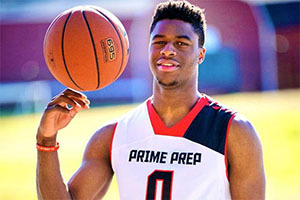 In recent articles examining the class of 2014, Mudiay has been hailed as being the number one point guard and he has been listed as the number 2 overall player. The top billing in the eyes of many people is falling on Jahil Okafor, a centre who is heading to Duke, but it is easy to see that there is a great deal of praise on offer for Mudiay. The player had supposedly given his word that he would be heading to the SMU Mustangs, following in the footsteps of Larry Brown, a legend of the NBA but he has now decided to take a path that was taken by Brandon Jennings. Jennings decided to head to Italy and Rome as opposed to playing in college in the US, and this move to another culture and country can provide benefits to a developing player, as long as they show the right attitude. There will be a need for Mudiay to embrace the local culture but if he does, there is a strong chance he will come out much stronger for the experience. There is already the likelihood he will come out much richer for it! Not every 18 year old would be keen to head to China for a year but this could be the chance that sees Mudiay become a major player in the years to come.